Rosacea is a chronic (ongoing) inflammatory skin condition that usually affects the face. The condition first appears between the ages of 30 and 50 years. People of all skin colours and types can get rosacea, but it’s more common in people with fair skin4. It is characterized by persistent facial redness3, owing to enlargement of the small surface blood vessels (capillaries) of the skin. Additionally, the redness may be accompanied by small lumps and bumps which can often be confused with acne pimples. Rosacea and acne are two different conditions and it’s important you get an accurate diagnosis to enable you to get the right treatment. In men, severe rosacea can cause the nose to become reddened and enlarged (rhinophyma). The symptoms tend to worsen with advancing age. There is no permanent cure. Huynh T. Am Health Drug Benefits 2013; 6(6): 348–354. Moore S. Face values: Global Perceptions Survey report 2013. National Rosacea Society (NRS) 2015, May 28. National survey reveals that rosacea sufferers often hide behind cosmetics before treating the condition. Available at www.rosacea.org/press/national-survey-reveals-rosacea-sufferers-often-hide-behind-cosmetics-treating-condition (accessed 18 April 2017). Del Rosso J et al. Cutis 2013; 92: 234–240. Wolf J. Acne and rosacea: Differential diagnosis and treatment in the primary care setting. Available at www.medscape.org/viewarticle/441986_1 (accessed 18 April 2017). Del Rosso J. J Clin Aesthet Dermatol 2012; 5: 26–36. Goldgar C et al. Am Fam Physician 2009; 80: 461–468. There are a number of factors that may contribute to the cause of rosacea such as genetics, environment and inflammatory triggers. 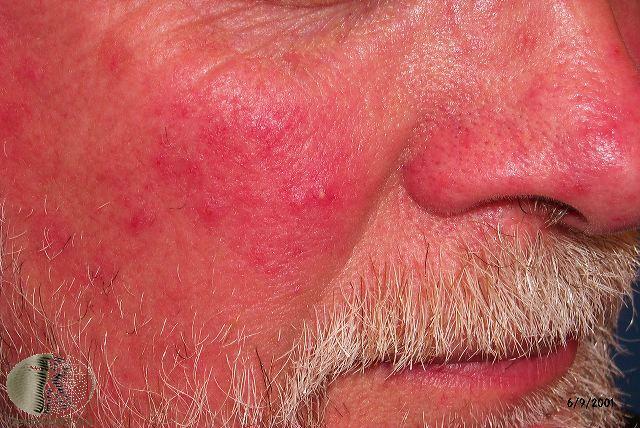 Certain triggers can induce an exaggerated immune response in predisposed individuals, leading to vascular and cutaneous (skin related) changes which manifest in the common signs and symptoms associated with rosacea. Rosacea doesn’t just affect your complexion. When your self-confidence suffers, so does your ability to enjoy life. In this way, rosacea can begin to affect your relationships, your social life and your work3,4. Rosacea is medical condition, and help is at hand. 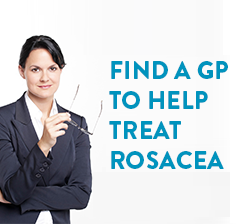 When you talk to your doctor you’ll receive credible information and advice about rosacea treatments. Your doctor can also help you manage any anxiety or unhappiness you may be feeling5. van der Linden M et al. Acta Derm Venereol 2015; 95: 395–400. Dirschka T et al. Dermatol Ther (Heidelb) 2015; 5: 117–127. It’s not always easy to diagnose rosacea – people may initially mistake it for other skin conditions1,2. As a result, people may not receive the correct treatment for rosacea. For example, people with lumps and bumps (papulopsustular rosacea) can often mistake this for acne. Treatments specifically developed to treat acne will not help with rosacea and may even make it worse. To get the correct treatment for your condition, you will need a proper diagnosis. This is why it’s important to resist the temptation to self-diagnose and speak to your doctor. They will take into account your signs and symptoms, triggers and medical history to ensure you receive the best treatment for your condition3. After diagnosis, you and your doctor can work together to find a management plan. As the sign of rosacea vary from person to person, there is no ‘one size fits all’ approach. Your doctor will recommend treatment options based on your needs4,5. In addition to medical treatment, you can help manage your rosacea signs by avoiding your ‘triggers’. Triggers can cause a flare-up (worsen the severity) of your rosacea signs. Taking an active role in your care and treatment can help you get the best possible results from your management plan. Olazagasti J, Lynch P and Fazel N. Am J Orthop 2014; 94: 39–45. Archer CB et al. Clin Exp Dermatol 2012; 37 (Suppl. 1): 1–6. Del Rosso J et al. Cutis 2014; 93: 134–138. Is it normal to get embarrassed or have low self-esteem because of your Rosacea? What are the available treatments for Rosacea? How can someone prevent rosacea?